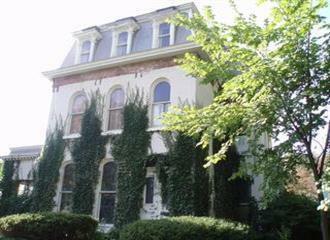 This elegant historic property, circa 1869, awaits a new owner! There are 2 finished one bedroom apartments in the rear of the building currently occupied by great tenants. The third unit holds the potential to be something quite amazing, with 11 foot ceiling and ten foot high round windows, this unit is in need of major renovation. It is commercially zoned and holds so much potential to be perfect for the buyers needs. Not all of the room sizes are listed above. Be sure to call listing agent for more information. The home will be sold as is. Do not miss the chance to check out this amazing piece of property!